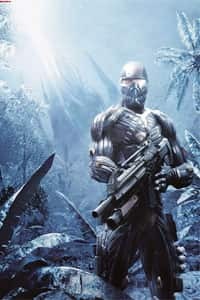 Global freezing: Aliens sabotage the planet in the new Crysis game. The eagerly anticipated follow-up to Half-life 2: Episode One is nearly here. The Orange Box actually consists of three games: Episode Two (the follow-up), Team Fortress (a multiplayer game) and Portal. Episode Two will carry on the adventures of Gordon Freeman and Alyx Vance as they battle Combine troops and alien beings in a desperate bid to reach the White Forest after having blown up the Citadel in a cliffhanger ending in Episode One. Because if they don’t, the super-portal that was borne of Citadel’s destruction will pave the way for the Combine to completely take over the world or something (a big no-no apparently)! If none of this is making any sense to you, you really should be playing Half-life, Half-life 2 and Half-life 2: Episode One—in that order (the latter two are included in The Orange Box as well). Episode Two will no doubt feature more of the superb graphics, audio and fantastic gameplay that have made the series such a gigantic hit. It’s them darned aliens again. Details are sketchy, but it appears that many, many years ago—during the Ice Age—an alien space-ship crashed into Earth and lay buried there for countless years, until the year 2019, when busybody US archaeologists stumble upon some mysterious artefacts on Spratly Islands in the South China sea. North Koreans somehow get involved, and since this will not do, you are sent in as a part of the elite Delta Force unit to find out what you can accomplish. Things go wrong when the aliens decide to flash-freeze the entire island and slowly planet Earth itself is threatened by the increasing influence of the freezing cold (the good news, then, is that global warming hasn’t wiped us out yet). The real reason why it has everyone excited is the whole slew of amazing technology that Crytek, the makers, have promised to feature in the game. This includes DirectX 10 support, soft shadows, lush destructible jungle environments, cool lighting, realistic AI, special effects and more. Alan Wake is a haunted man. A few years ago he used to be a horror writer who, taking inspiration from his strange dreams, wrote a best-selling book based on them. Sometime later, his fiancée suddenly disappears in a situation similar to one in his book. This disturbs Alan greatly and he begins to suffer from insomnia. No new dreams, no new book, so Alan begins his descent into depression. Being a sensible man, he decides to check into a clinic in the town of Bright Falls. But when he gets there, he starts getting terrible nightmares and he starts writing a new book. Unfortunately, he soon discovers that events in real life are beginning to reflect what he writes in the book and, very soon, Bright Fall doesn’t seem to be such a cheery place anymore. The game is set to feature dynamic lighting and shadows, day and night cycles, weather conditions, realistic fog and other interesting stuff to make it as eerily realistic as possible, no doubt. Can’t wait.